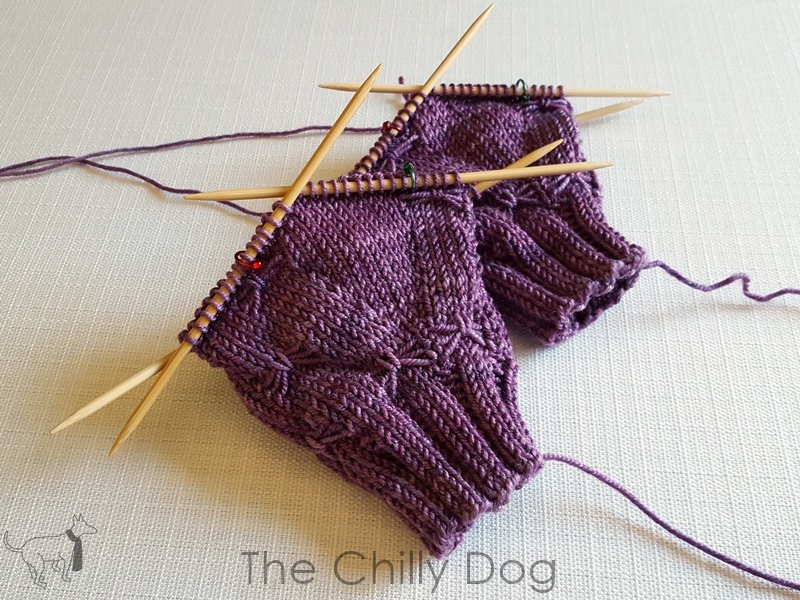 Now that the cuff of our mitt is complete, let me show you how to knit the thumb gusset. The thumb gusset on a mitten (or glove) is simply an area on the side of the mitt where you are increasing the number of stitches in order to make a shaped thumb hole. The thumb gusset is worked by increasing one stitch with an M1L after the first marker, knitting to the second marker and increasing one stitch with an M1R before the second marker, while continuing in the established bowknot pattern for the first 5 and final 40 sts of each rnd. Increases are made every third round. For pattern readability, Increase Rnds are marked in red. As the thumb gusset gets wider, it is helpful to rearrange your work onto 4 dpns. Rnd 9: k5, M1L, k1, M1R, k40. Rnd 10-11: k all sts. Rnd 12: k5, M1L, k3, M1R, k40. Rnd 13: k10, [K5, yfwd, sl5, ybk] 4 times. Rnd 14: k all sts. Rnd 15: k5, M1L, k5, M1R, [K5, yfwd, sl5, ybk] 4 times. Rnd 16: k all sts. Rnd 17: k12, [K5, yfwd, sl5, ybk] 4 times. Rnd 18: k5, M1L, k7, M1R, [K7, make Bowknot, k2] 4 times. Rnd 19-20: k all sts. Rnd 21: k5, M1L, k9, M1R, K40. Rnd 23: yfwd, sl5, ybk, k11, [yfwd, sl5, ybk, k5] 4 times. Rnd 24: k5, M1L into the carried strand from the last round, k11, M1R into the carried strand from the last round, k40. Rnd 25: yfwd, sl5, ybk, k13, [yfwd, sl5, ybk, k5] 4 times. Rnd 27: yfwd, sl5, ybk, M1L (this increase will feel very tight as you work it because the stitch before the lifted strand was slipped), k13, M1R, [yfwd, sl5, ybk, k5] 4 times. Rnd 28: k2, make Bowknot, k17, [k2, make Bowknot, k7] 4 times. Rnd 29: k all sts. In the next lesson I'll show you how to hold your gusset stitches while we finish the hand section of our mitts. Learn the raised, make 1, increase and how to shape a thumb gusset while you knit a pair of Butterfly Kisses KAL mitts.